The main issue I had is that I really loved the previous book, but this one renders it pointless and it’s making me retroactively dislike it, why? Because Magic Shifts was a bridge book that perfectly set up what I thought was the end point of the series, meaning Kate was going to trap Roland in a Djinn box. But Magic Binds had other plants, I guess, and it ignores that whole potential plotline entirely and literally drops it with one line. Now, before someone tells me I read too much into the box thing, listen, the previous book ends with her realizing the box is a viable way to defeat this super powerful, god-like evil; the very last line is Kate asking about how to build the thing. It’s an exciting, borderline cliffhanger-ish ending, and it was great. How is that not setting up the next book? Hey, maybe the story wasn’t working, which is fine, but what clumsy way to redirect things. What else? Right, my favorite trope: people who see the future gives our heroine vague clues about it, so that she can conveniently figure out how to get out of trouble. These are also self-fulfilling prophecies, because the book needs conflict. It gives the whole story the stink of deus ex machina, even if it’s not quite that, but yeah, it was disappointing and really didn’t work for me. That said, and this speaks of how talented the authors are, there was a lot of delicious tension created because of the prophecies, and I was worried about everyone, Kate included, at one point or another. And speaking of Kate, she’s now apparently tempted by the dark side of her power, which is a situation that would have been pretty great if it hadn’t come out of nowhere. It feels to me that this is the type of major character development and threat that could and should have been introduced organically through previous books, but because it’s simply dumped on us without warning, I was too distracted by the randomness of the situation to actually worry. On the other hand, there’s a lot of stress put in Kate and Curran’s relationship, in part because she’s forced to cross some of his hard lines. This was pretty well done, in my opinion, and in fact, the book is at its strongest when dealing with the characters and their different relationships to each other. But then again, we have spent several books worrying about Julie finding out about how she’s bound to Kate and how it will affect them, but that’s another revelation that gets dismissed with a couple of lines, so all that hard work worrying was for nothing, I guess. I’m also having a hard time with Roland. I can’t figure out whether he’s supposed to be funny or creepy or what, but there’s something tonally off about him that I can’t quite pinpoint. I don’t find him threatening or scary, and all the confrontations with him have been pretty anti-climactic so far, so whatever anticipation he might have inspired is mostly lost. I don’t know if the next book is the last one, but I’m not sure the series can handle more filler stories that lead nowhere. 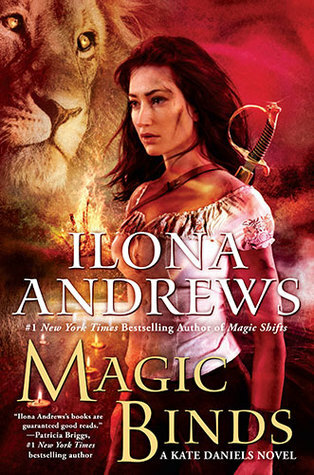 Okay, I’m making it sound worse than it is, and maybe I have to adjust my expectations, but Ilona Andrews is so talented and this world so strong and compelling that it’s hard not to expect too much from a series that has been consistently delivering for years. On the other hand, the book is doing just fine, so maybe it’s not the book, it’s me (nah, I’m pretty sure it’s the book). Okay, I've struggled from the moment Roland was finally introduced and I haven't stayed up with the series since because he felt so off to me. "Tonally off" is a perfect way to describe it. But he's just so central to EVERYTHING that I'm having a hard time reconciling how he's being portrayed with the place that he's held in the series up till now. I am definitely going to get caught up. I just . . . sigh. Yes! It's like it's trying too hard to be funny and.. cute (???) and it strips him of menace and gravitas. Hugh was a bit like that, too, but he's not the final boss, so it didn't bother me as much. But Roland, sigh. In one of the previous books he invites them to like Applebees and have lunch, which I think it was supposed to be comedic but also threatening and it ended up being neither and reading like bad fanfiction. He feels like a constant misfire in terms of characterization, and that's a huge issue in a series with such huge stakes. Ugh, that's exactly it! He's the Big Bad. He has to be. That kind of silly humor was never going to work. I forgot about the Curran thing. If that's where it's headed and he is now immortal, I'm going to be even more annoyed because that's another out-of-nowhere, random, convenient development; just, come on! He's not immortal because he happened to come across a divine creature and felt the urge to eat it? I actually thought the function of that was to make him a bit more powerful during the final battle to even out the odds, but it didn't come back again other than Kate mentioning that he was faster at stronger. The consecuences of that are up in the air. I'm also purposely not thinking about the baby, becuase, what, are we getting a book with her pregnant and endangering her life? Or one that endangers the life of a baby? Either way it sounds like a corner that's going to be difficult to get out of. *That should read: He's *now* immortal, not he's *not* immortal. The dark side thing felt like a logical progression from her sucking power out of the city when she was dying in the previous book. But that was two books ago, wasn't it? I mean the claiming of the city, which is what's making her so powerful that she's being tempted by the darkness. And it's not that it doesn't make sense or that it's not something interesting to explore, but it happened out of nowhere when there's been one full book and part of another to foreshadow or give us clues that this might happen or was starting to happen.